William the Conqueror may have undisputed claim over the Kingdom of England, but he must still deal with the Celtic Lords of Scotland should he have designs on calling himself monarch of the British Isles. 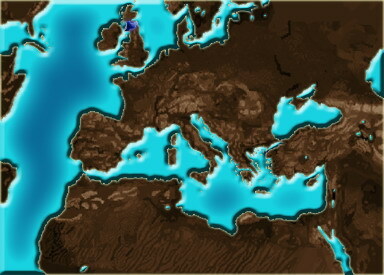 In fact, Malcolm III, the ruling King of Scotland has already made several forays into England's north since the Normans have arrived, continuing a legacy of conflict between Celtic and continental bloodlines that has existed for over a millennium.Scotland may have a proud track record of defying much greater powers south of the border, including the mighty Roman Empire, but some of the highland nation's more brilliant scholars are now preaching caution to Canmore. The Britons are no longer a distant set of islands on the edge of civilisation, and to continue to think of this position as being truly secure would be to lie to one's self. The arrival of the Normans, with their heavy cavalry is proof that continental powers are now capable of arriving in force across the sea, and that warfare itself is evolving. None of Canmore's thrusts into Northumbria have thus far been decisive, and perhaps this is not something Scotland should be doing alone.At present, the French would appear to be Scotland's most logical ally. The animosity between the French monarchy and the Normans has only grown with William's expansionist behaviour, and Philip would be mad not to want England's attention split across two fronts.Of course, until the Scots can either secure a powerful ally or bring their armed forces up to the standards of the major European powers, it may be well worth it for Malcolm III to simply swallow his pride and avoid entering any further conflict with the English, or heaven forbid, contemplate an alliance. Strong Scottish melee unit armed with sword and shield and wearing plate armour. Scottish shock troops wielding a large two-handed sword and armoured in chain. An upgraded Cog equipped with small artillery pieces in the fore and aft castles and a durable oak hull. Equipped with light mail and spear, this unit is handy for out flanking your opponent and chasing down archers. Archers from the highlands armed with a standard bow and a one-handed axe for melee. The best Scottish archers available, armed with a bow, mail and hand axe, these archers are good in a fight. Ill disciplined and fierce peasants from the Highlands armed with a basic hand weapon. Fierce and wild warriors from the Scottish Highlands fight with little to no armour and are equipped with an axe. Well trained, but sometimes reckless clansmen armed with pikes, able to form a wall of pikes against cavalry. Lowland Scots levied into a militia to defend their settlement. Armed with pikes for good defence against cavalry, but lacking in armour. Levied troops equipped with pikes and protected by heavy armour. Good defence against cavalry. Well armoured Pikemen made up of Scottish nobles preferring to fight in the infantry. A siege weapon capable of firing over walls and plunging shots down on enemies hiding behind said walls. Encased in mail and equipped with a two handed axe these early knights are formidable fighting machines. The first wielders of the longbow. Totally unarmoured means they need to stay out of melee. Can lay stakes. Fierce Scottish warriors who have settled in Ireland. Formidable troops armed with large two-handed axes and wearing light armour. Makes excellent use of spears and pikes. Lacking in cavalry, and the nobles often prefer to fight on foot. WARNING! This baseline short description should never appear on screen! A Templars' Minor Chapter House allows the recruitment of Templar knights. A St. Johns' Minor Chapter House allows the recruitment of Hospitaller knights. Slave Market considerably improves the trade but also affects the happiness of the common folk decreasing it noteably. It requires slave resource in province to work. Forging Shop provides the basic melee weapon upgrade and slightly increases the profit from the trade. Local resource of iron or tin provides the material to work. Mint Coin requires gold or silver to function and brings a moderate bonus to the trade in all cities of your empire but also deacreases the law abidience due the corruption. Jeweller's Shop uses local resource of gold, silver, ivory, or amber to provide an extreme boost to the trade as some people not only travel hundreds of miles to bring jewellery from far away land, but also are obsessed by it. Working with the local resource of timber Joiner's Shop reduces the costs of the wooden buildings and ships. Also it slightly improves the trade but only during the winter, the peak logging season. Vineyard gives a slight boost to the trade in region. Its value is greater in summer, the peak grape-harvesting season. If you have an inn in the town common folk also will be glad to take a cup of good wine, sometimes even loosing the measure and health. Textile Mill provides above average impact into the trade of the region, which is even greater if there is local resource of dyes to complete the process of cloth fabrication. Of course the trade is much higher in summer during the linnen harvesting season. Cotton Mill provides above average impact into the trade of the region, which is even greater if there is local resource of dyes to complete the process of cloth fabrication. Of course the trade is much higher in summer during the cotton harvesting season. Silk Mill provides high impact into the trade of the region, which is even greater if there is local resource of dyes to complete the process of cloth fabrication. Of course the trade is much higher in summer when the silkworms are in active state. Fishers Quarter gives a slight bonus to the trade in region as well as improves the health in the province. Due to the storms and bad weather in the winter season its trade bonus is somewhat decreased. Windmill provides a slight bonus to the trade of the region which is greater during the good harvest summer seasons. It also improves the health in province. A 1/10th share of the flour was paid to the miller in return for his service. Sugar Refinery gives the moderate bonus to the trade, which is greater in the warmer summer season, but also are not very low in winter since the sugar plantation are mostly in the warm middle eastern regions. It also gives a slight health bonus to the province. Marble Workshop gives high bonus to the trade in region and also increase the happiness due the masterpieces made of it. Wool Farm provides the basic cycle of cloth manufacturing without dyeing or finishing of the woven product. Its trade impact is beyound average but somewhat increases in the winter time, when the mass sheep shearing occurs. Trappers Hut provides the high bonus to the trade as well as a happiness increase if there are furs resources in region. The bonus is much higher in the winter fur hunting season. Glass Blower adds big bonus to the trade of the region and also encorages the peolple happiness with a state of art masterpieces. The saltern gives the city high trade bonus based on the level of market city has. Bakery provides the settlement with a fresh bread slightly increasing the population growth, happiness and trade of the region. Brewery provides the settlement with fresh beer slightly increasing the happiness and trade of the region. A scholarium is necessary for the civilian education and offers a happiness bonus. Forging Shop provides the basic melee weapon upgrade. Local resource of iron or tin provides the material to work. Working with the local resource of timber Joiner's Shop reduces the costs of the wooden buildings and ships. Also it provides better material for the bows and crossbows.